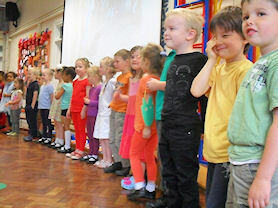 Reception performed their very first class assembly and they did not disappoint! 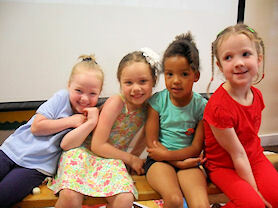 The children shared with the rest of the school, and Mums and Dads, what they have been looking at in class over the past half term. They told everyone about our work on growing seeds and life-cycles. 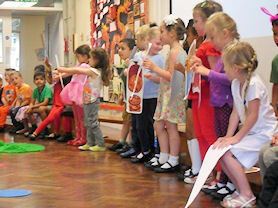 They even treated us to a superb 'growing' dance, which had been put together in PE lessons as well as a fantastic retelling of the well-loved story 'The Very Hungry Caterpillar'. 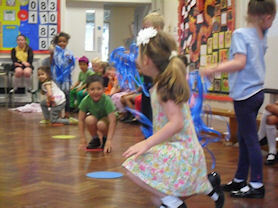 The children did themselves proud and put smiles on everyone's faces; what a super way to start the day! The Hungry Caterpillar munching his way through five oranges. More eating on Saturday for the Very Hungry Caterpillar. 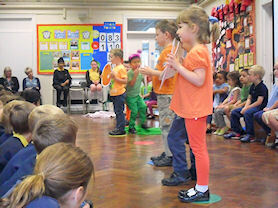 Singing our song – 'Everything Around Me'.